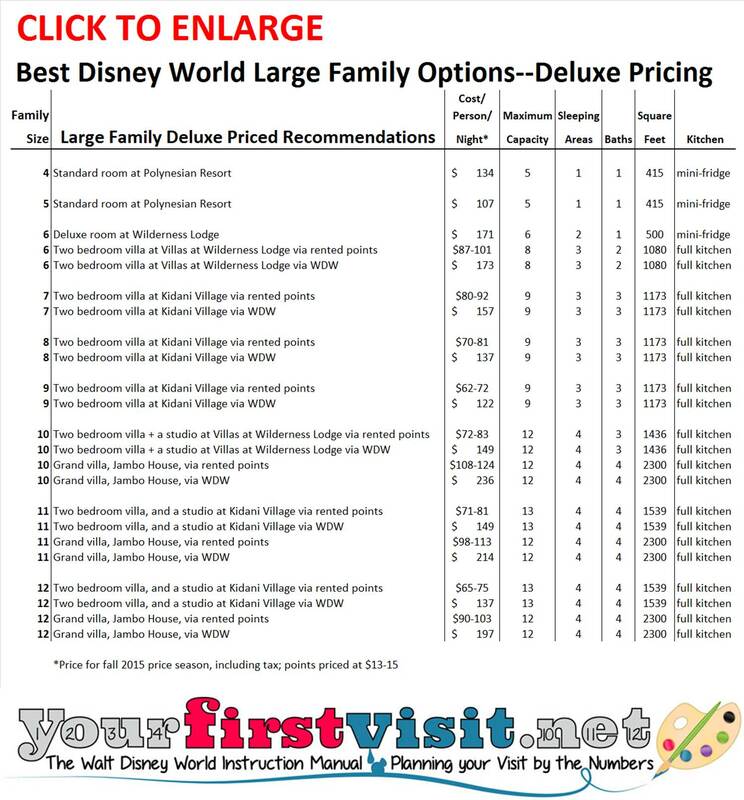 This page recommends Walt Disney World accommodations for large families seeking deluxe accommodations, sorted by family size. Click the image to see the recommendations below in chart form. The chart also includes additional information—for example, number of bathrooms, nature of any kitchen facilities, and total square feet. As always, when more than one similar option is available, recommendations are made based on appeal to kids and transportation convenience. All prices are for the 2015 Fall price season. 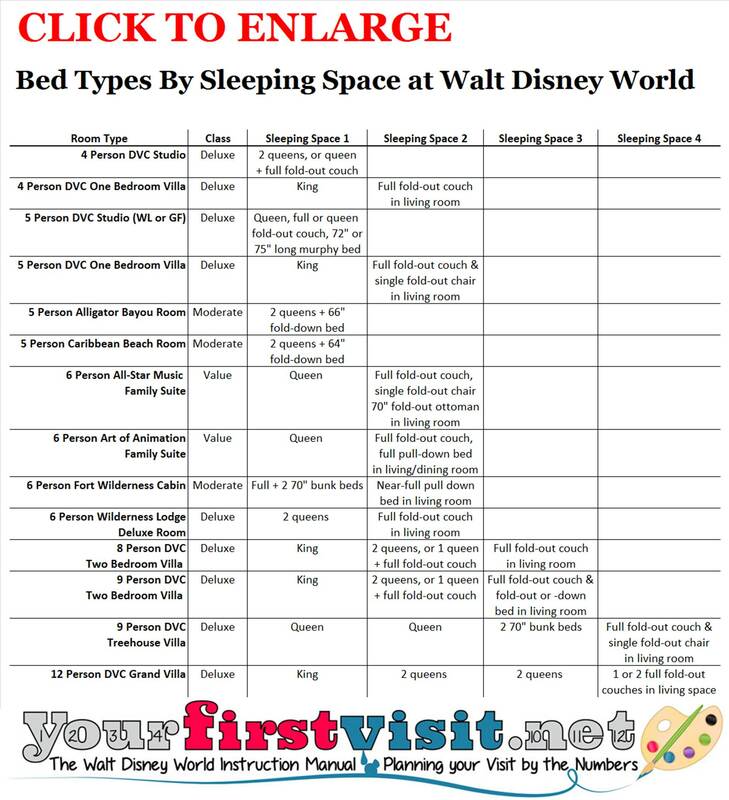 See this for when to go to Walt Disney World. Prices will be higher during most other parts of the year, but in similar proportions. See this for price seasons at Walt Disney World. 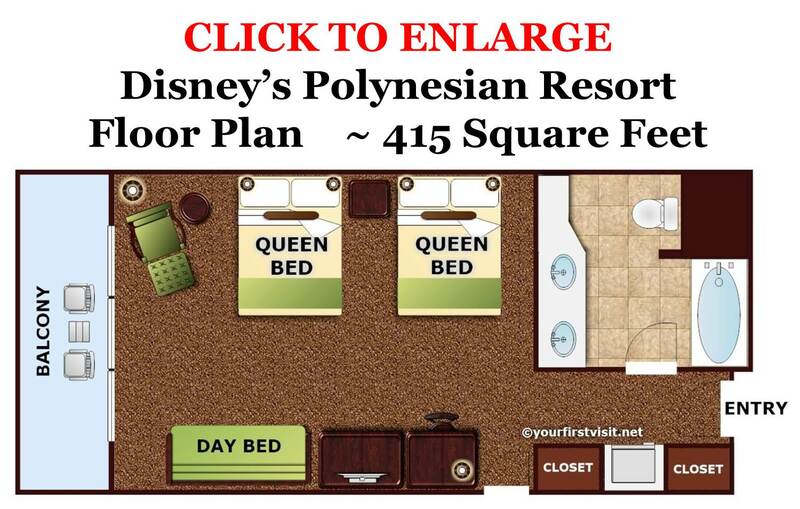 Basic Recommendation for families of up to 5 people: Disney’s Polynesian Resort. Cost/ Person/ Night: $107, for families of 5. 6 people: Your best bet is a Deluxe Room at Disney’s Wilderness Lodge. These concierge service rooms hold 6 in a mini-suite, with two queens in the bedroom and a queen sized sleeper sofa in a sitting room. Cost is $171/ person/ night. For a review of these rooms, click here. 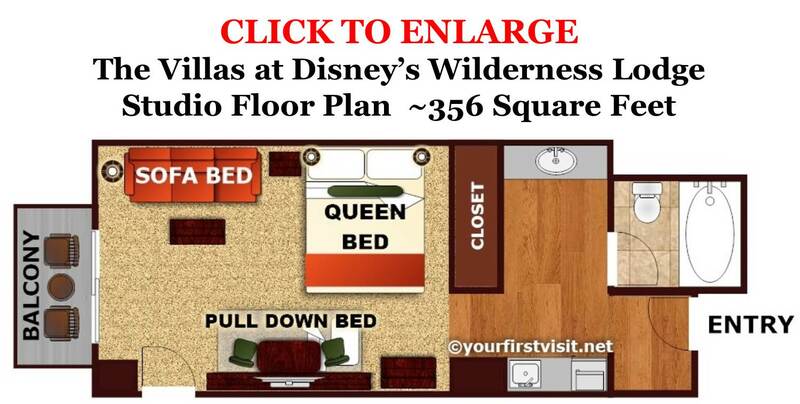 Another great option, a little easier to reserve (as there are a few more such to choose from) is a Two Bedroom Villa at the Disney Vacation Club (DVC) property the Villas at Disney’s Wilderness Lodge. If you reserve through the WDW website, this will cost $173/ person/ night (but see below for renting points). The Villas at Disney’s Wilderness Lodge are not as convenient as the Polynesian, but are even more kid appealing. A Two Bedroom Villa provides one bedroom with a king bed that sleeps two, and one with two queens that sleeps 4. In addition, you get a kitchen/dining/living room combination with a sleeper sofa that sleeps two more. The least expensive way to get a 2 Bedroom Villa at the Wilderness Lodge is to rent points from a DVC member. If you are successful at this, you will pay $87-101/person/ night. See this for details on how to do so. 7 people: The Two Bedroom villas at the Wilderness Lodge don’t hold 7 (or 8) well. A better choice for parties of these sizes is a Two Bedroom Villa at Kidani Village. Cost of Two Bedroom Villa at Kidani Village: via Disney Website, $157/person/night; via renting points, $80-92/person/night. 8 people: Same approach as “7 people” above. 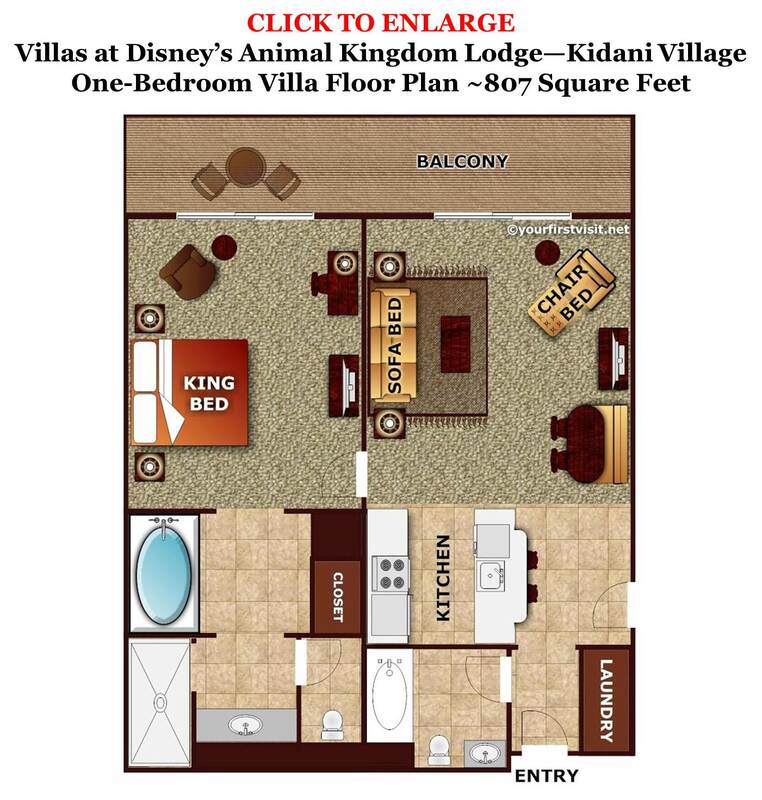 Two Bedroom Villa at Kidani Village: via Disney Website, $137/person/night; via renting points, $70-81/person/night. 9 people: Same approach as “7 people” above. 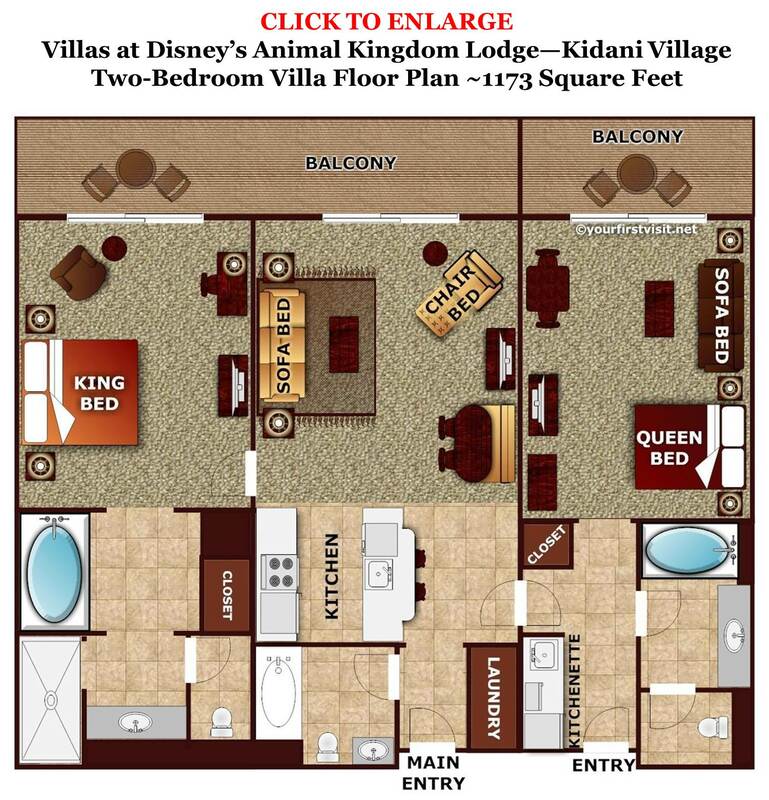 Two Bedroom Villa at Kidani Village: via Disney Website, $122/person/night; via renting points, $62-72/person/night. 10 People: If the group must all be in the same space only a Grand Villa will work. Grand Villas at Jambo House are the best choice for first time family visitors. A Grand Villa has three distinct bedrooms—two sleeping 4 each in two queens, and one sleeping two in a king. Two more sleeping spaces are available in sofa-beds in the common rooms. 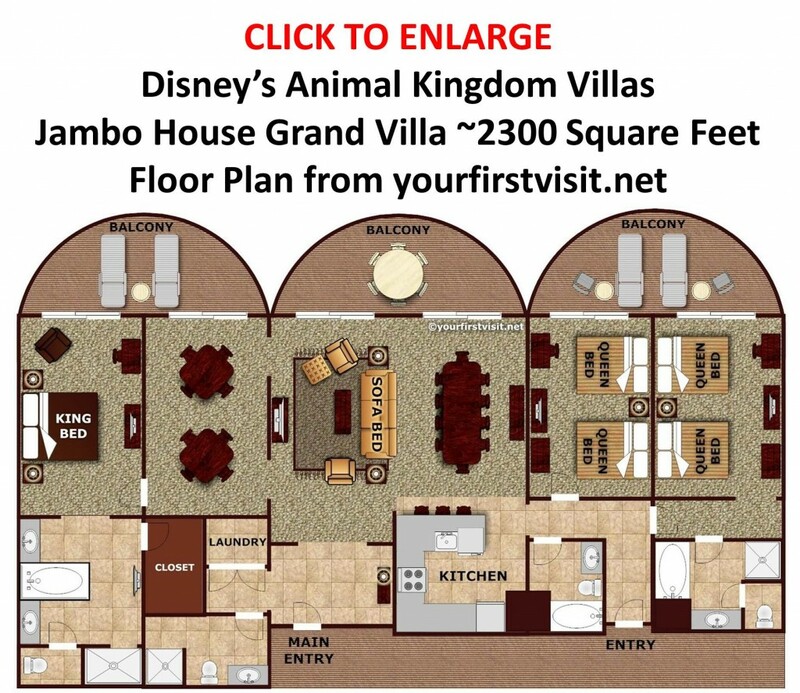 A Grand Villa at Jambo House will cost about $236/person/night for 10 people if your reserve though the WDW website; if you can manage to rent points, the cost drops to $108-124/person/night. Another less expensive option for a group this size is to have most of the group together but up to 4 or 5 in a nearby but not in connected space. There are some families or parties for which this might actually be a benefit. For example, they may want to group the littlest children and their parents into an 8 person space, and reserve a 4-5 person space for childless couples, grandparents, and/or teenagers, all of which may either benefit from the privacy and/or contribute to the peace of mind of the party of up to 8 by being in a separate space. If this describes your group, then your best bet is both a 2 Bedroom Villa and a separate Studio at the Villas at Disney’s Wilderness Lodge. This gives 4 bays, not 6 as in a Grand Villa, and of course one of the bays will not be connected to the rest. But the price will be much lower than a Grand Villa. This same option works for families that don’t necessarily want this separation of part of their party, but are willing to accept it because it is cheaper than a grand villa. In cash, renting both a Two Bedroom and a Studio at the Villas at the Wilderness Lodge will be in total $149/person per night for 10 people; if you can rent points, the cost drops to $72-83/person/night. 11 People: Your basic options are a Grand Villa at Jambo House or a Studio and a Two Bedroom Villa at Kidani Village. A Grand Villa will cost $214/person per night if you reserve through the website, and $98-113/person/night if you rent points. 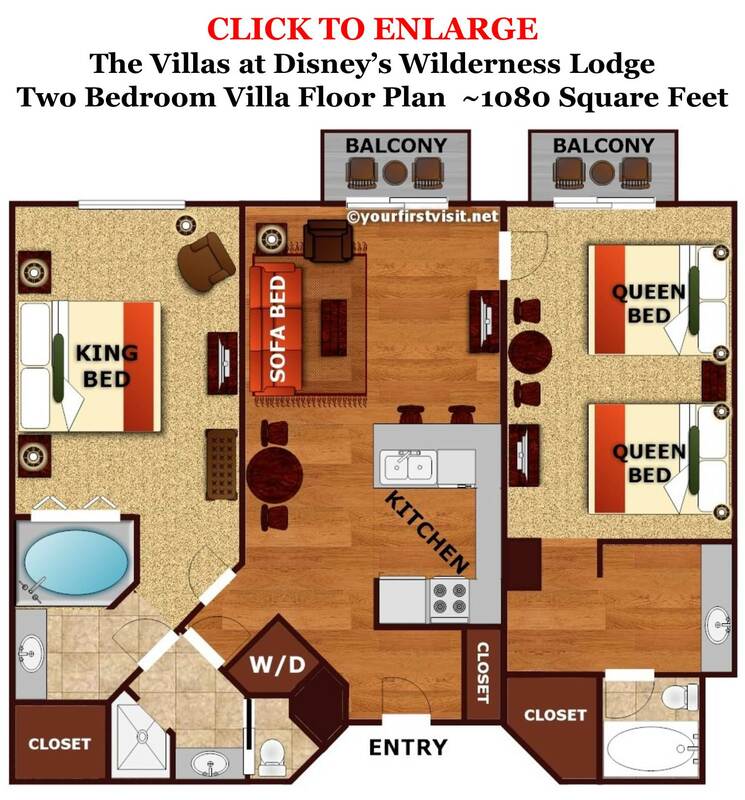 A Studio and a Two Bedroom at the Villas at Kidani Village will cost (in total) $149/person/night if you reserve over the website, and $71-81/person/night if you rent DVC points. 12 People: Your basic options are a Grand Villa at Jambo House or a Studio and a Two Bedroom Villa at Kidani Village. A Grand Villa will cost $197/person per night if you reserve through the website, and $90-103/person/night if you rent points. A Studio and a Two Bedroom at the Villas at Kidani will cost (in total) $137/person/night if you reserve over the website, and $65-75/person/night if you rent DVC points. 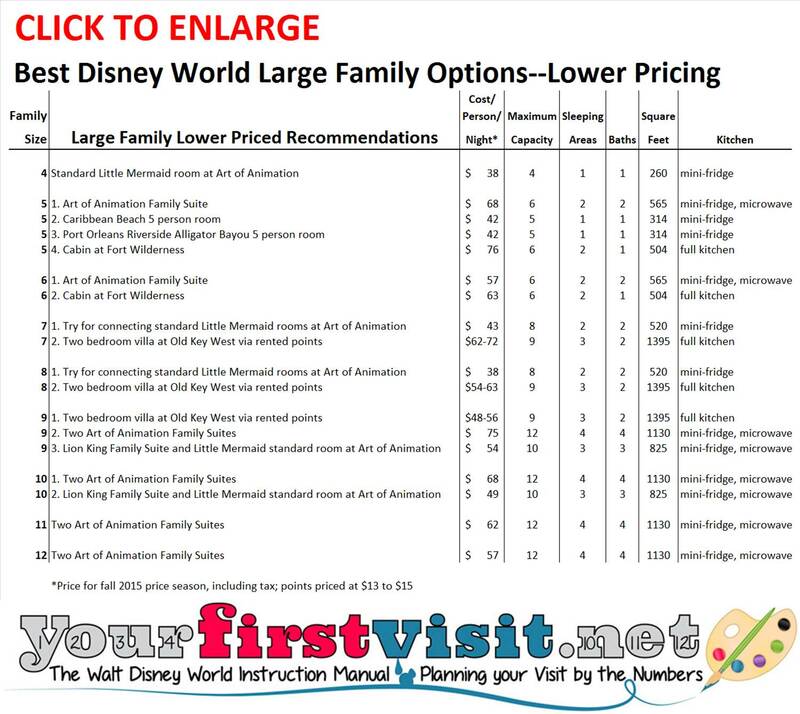 This page recommends Walt Disney World accommodations for large families seeking lower prices, sorted by family size. See this page for an introduction to Large Families at Walt Disney World. Click on the image above to see the recommendations below in chart form. As always, with one exception, when more than one similar option is available, recommendations are made based on appeal to kids and transportation convenience. The exception is advice regarding Old Key West–which is not the most kid appealing of the DVC resorts, but is the least expensive! All prices are for the 2015 Fall price season. See this for when to go to Walt Disney World. Prices will be higher during most other parts of the year, but in similar proportions. See this for price seasons at Walt Disney World. 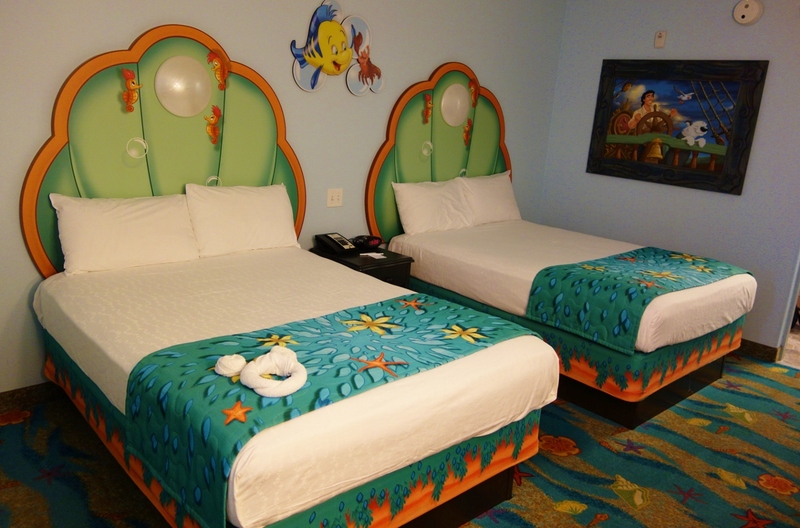 Basic Recommendation: Families with 4 people or fewer: Standard (Little Mermaid) room at Disney’s Art of Animation Resort. For 4 people, you will pay $38 per person per night. 5 people: Best choice= Art of Animation Family Suite, $68/person/night. You get two baths, a private bedroom with a queen-sized bed, a microwave and mini-fridge, and a couple of living areas with couches and tables that convert into sleeping space for 4 more people. 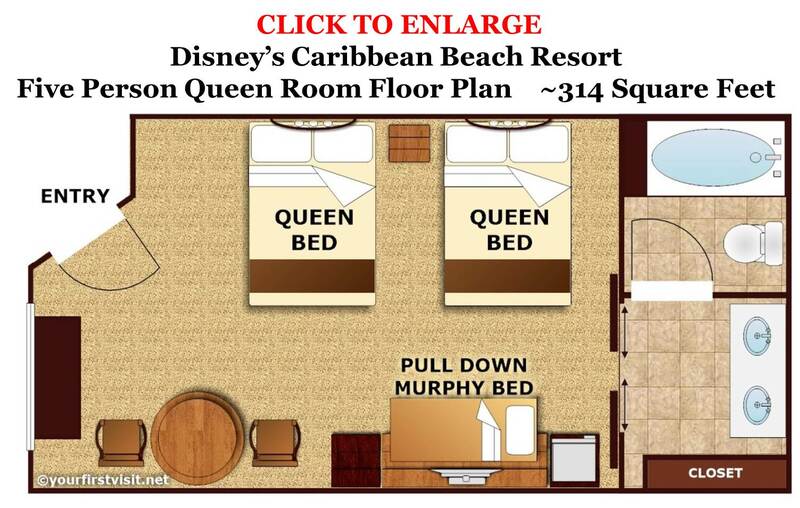 The next best choice is one of the new five person rooms at Disney’s Caribbean Beach Resort, which hold four in two queen beds plus a fifth person in a small (~64 inch by ~30 inch) fold-down bed, for $42/person/night. This option is not recommended for first-time visitors, as while Caribbean Beach has the highest kid appeal among the moderates, it is not as kid-appealing as Art of Animation, and is inconvenient. 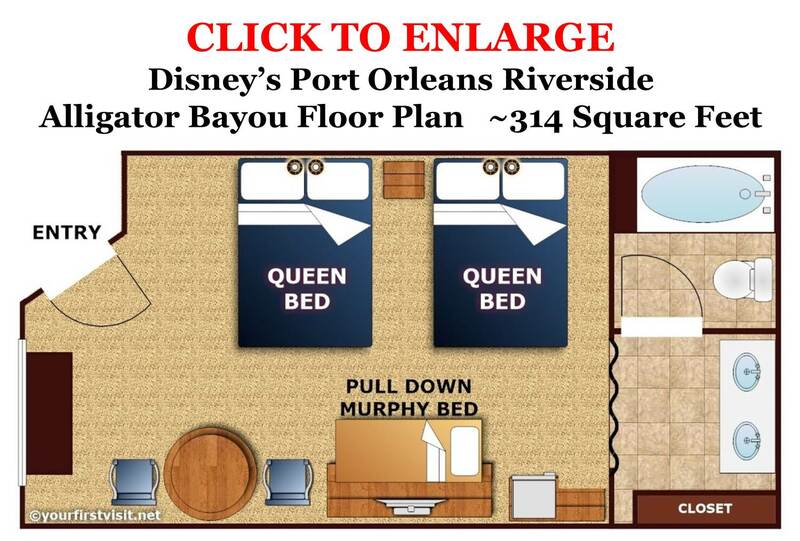 The next best choice is the Alligator Bayou section of Disney’s Port Orleans Riverside Resort, which hold four in two queen beds plus a fifth person in a small (~66 inch by ~31 inch) fold-down bed, for $42/person/night. This option is not recommended for first-time visitors, as the resort not nearly as kid-appealing as Art of Animation. The resort is less kid-appealing than Caribbean Beach, and Caribbean Beach rooms have a better arrangement of drawer space. 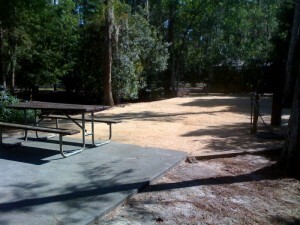 The final option is a 6-person Cabin at Disney’s Fort Wilderness Campground and Resort. This option is not recommended for first-time visitors, as it is very inconvenient, and not nearly as kid-appealing as Art of Animation. The cost is $76/person/night. You get a full kitchen and two sleeping spaces. One sleeps 4 in a full bed and bunk beds–the bunk beds are 70″ long. The second sleeping space is in the combined living room/dining room/kitchen, where a full bed folds down from the wall. 6 people: Best Choice: Art of Animation Family Suite $57/person/night. See above for details. Next best choice–a cabin at Disney’s Fort Wilderness Resort, for $63/person/per night. See above–not recommended for first time visitors. 7 people: there are no good options for value pricing at this family or party size—or for 8 people either. You can try for connecting Little Mermaid rooms at Art of Animation, with no guarantees. Your cost for these will be $43/person/night. Your best choice to guarantee you will all be in the same space is harder to pull off. It requires renting enough points (NOT reserving this villa from the WDW website—this will cost MUCH more) from a current Disney Vacation Club owner to get a Two Bedroom Villa at Disney’s Old Key West Resort. You can rent points from Disney Vacation Club members on websites like SellMyTimeshareNOW.com, a sponsor of this site. See this page for how to do so. Success will get you a great space for $62-72/person/night. Disney’s Old Key West Resort is neither kid appealing nor convenient, but is the cheapest of the DVC resorts, and thus, when paid for using rented points, the only one that comes even close to the Value pricing range. For your money you will get two bedrooms, one with a king that sleeps two, and one with two queens that sleeps 4. In addition, you get a huge (compared to other DVC resorts) kitchen/dining/living room combination with a sleeper sofa that sleeps two more and a fold-out chair that sleeps a ninth person. 9 people: Rented points for a Two Bedroom Villa at Old Key West: $48-56/person/night. Otherwise, your only choices are rooms that don’t connect. One option is to rent two Family Suites at Art of Animation. These may be a hike apart–even if they are in the same section. Two suites will cost $75/person/night for a party of 9. Less expensive, but possibly leading to some family jealousy, is renting both a Family Suite and a regular Little Mermaid room at Art of Animation. (The Lion King suites are closest to the Little Mermaid section.) Both together will cost $54 per person per night. 10 people: No value-priced options guarantee you will all be in the same space. Two Family Suites at Art of Animation will cost $68/person/night. A Family Suite and a regular Little Mermaid room at Art of Animation will cost $49/person/night. 12 People: As in 11 people, rent two Family Suites at Art of Animation. $57/person/night. However, many families figuring out where to stay at Walt Disney World are concerned not only with the capacity of rooms but also bed sizes, and how beds are distributed among rooms. This way, Aunt Eileen isn’t forced to sleep in a bunk bed, in the same room as her nephew…unless that’s the plan going in! Note that more data about room types–such as baths, kitchens, and square footage–is available in the links for large families above, and reviews with even more can be found from the links on this page. Example floor plans tied to the details in the graphic are below. Four person DVC Studio floor plan. One sleeping area. A queen and a pull-out couch all in one space. Similar Studios are at the Beach Club and Saratoga Springs. Bay Lake Tower Studios sleep 4 on similar beds in much less space. Four person Studios at Old Key West have two queens, no couch, more space. 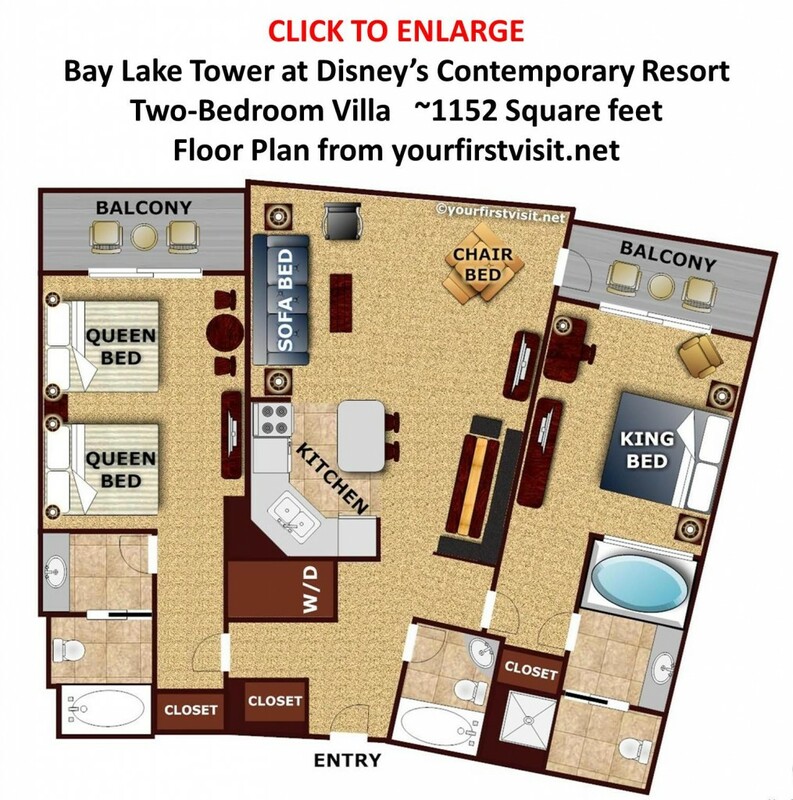 Four person DVC One Bedroom Villa floor plan. Two sleeping areas. One king in a private bedroom, and a fold-out full couch in a second space, the shared living/dining/kitchen area. 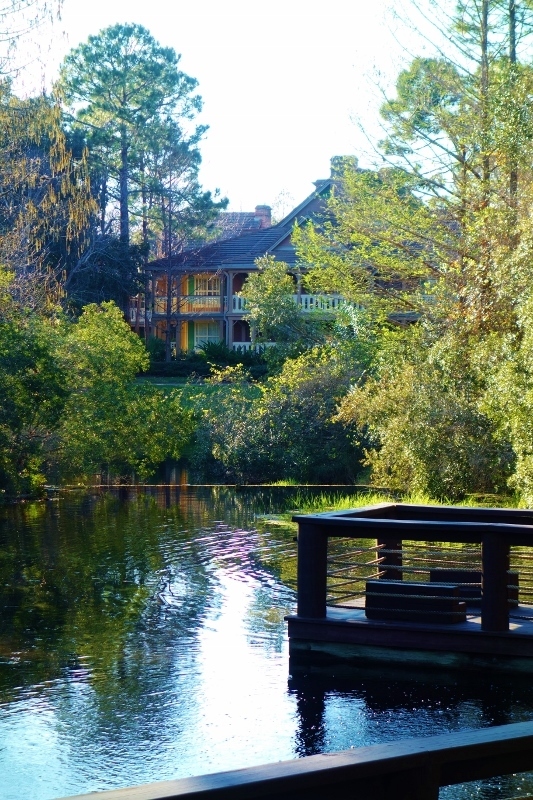 Similar spaces are at the BoardWalk Villas, the Villas at the Wilderness Lodge, and Saratoga Springs. Five Person DVC Studio floor plan. Villas at the Wilderness Lodge example. One sleeping area. Queens, pull-out couch, and fold-down bed, all in one space. 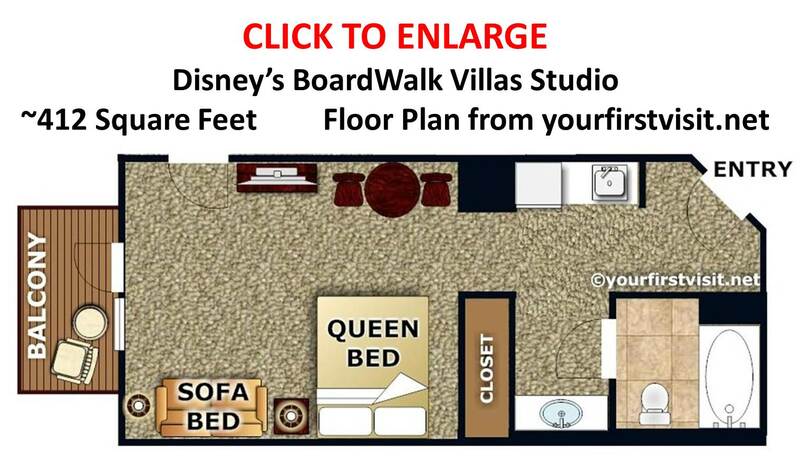 Similar sleeping arrangements are in the Studios at the Villas at the Grand Floridian. Five person DVC One Bedroom Villa floor plan. Animal Kingdom Villas Kidani Village example. Two sleeping areas. As in 4-person villa above, but also with a fold-out chair added to the shared space. Note also the second bath. Five person room, Port Orleans Riverside Alligator Bayou Section. One sleeping area. Two queen beds and one 66″ x 31″ fold-down bed in one space. Five person room, Caribbean Beach example. One sleeping area. Two queen beds and one 64″ x 30″ fold-down bed in one space. Expected to be bookable for 5 soon. 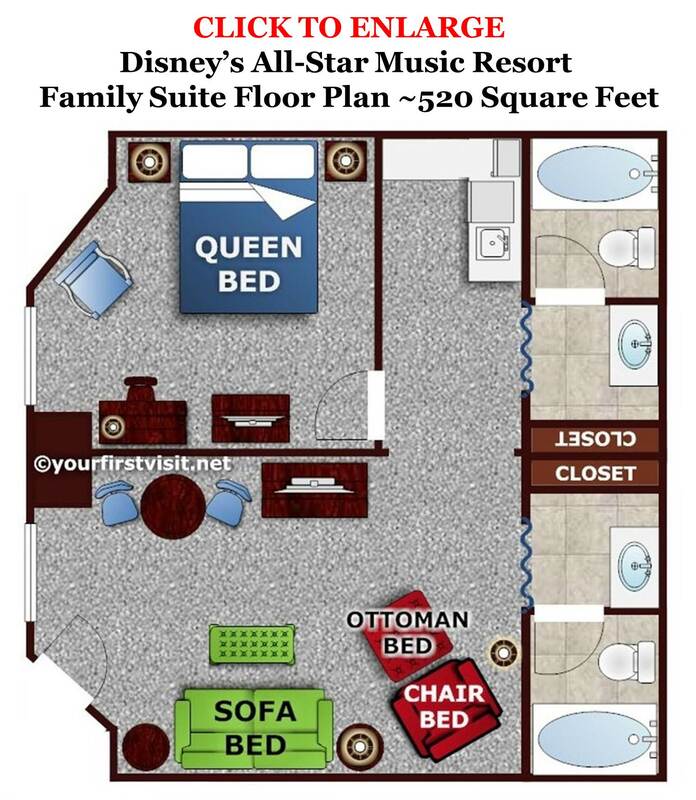 Six person Family Suites at All-Star Music floor plan. Two sleeping areas. One queen in a private room, one fold-out full couch, one fold out single chair, and one fold-out ottoman in another space. The ottoman bed is uncomfortable for taller or heavier kids. 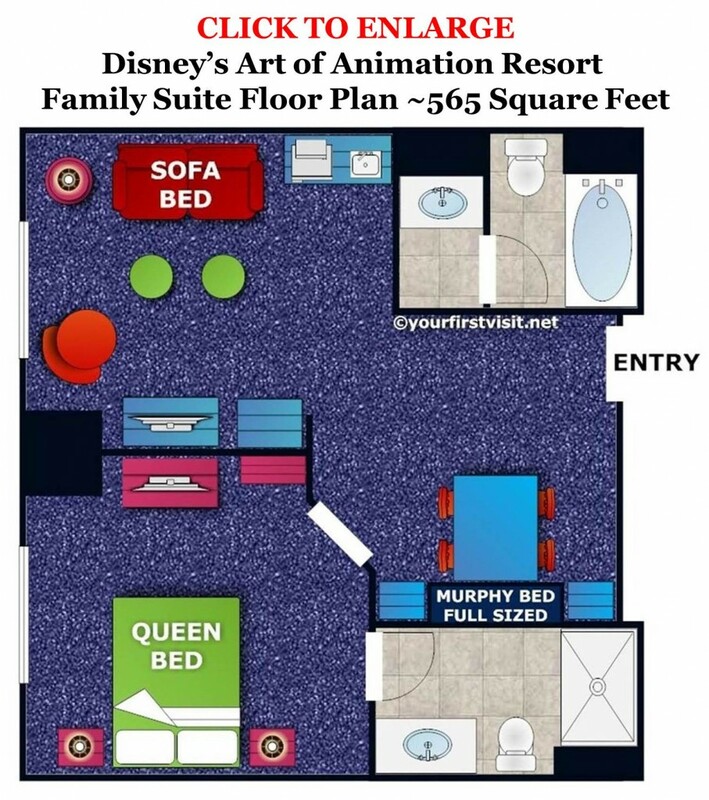 Six Person Family Suites at Disney’s Art of Animation Resort floor plan. Two sleeping areas. One queen in a private room, one full fold-out couch, and one near full Murphy bed. 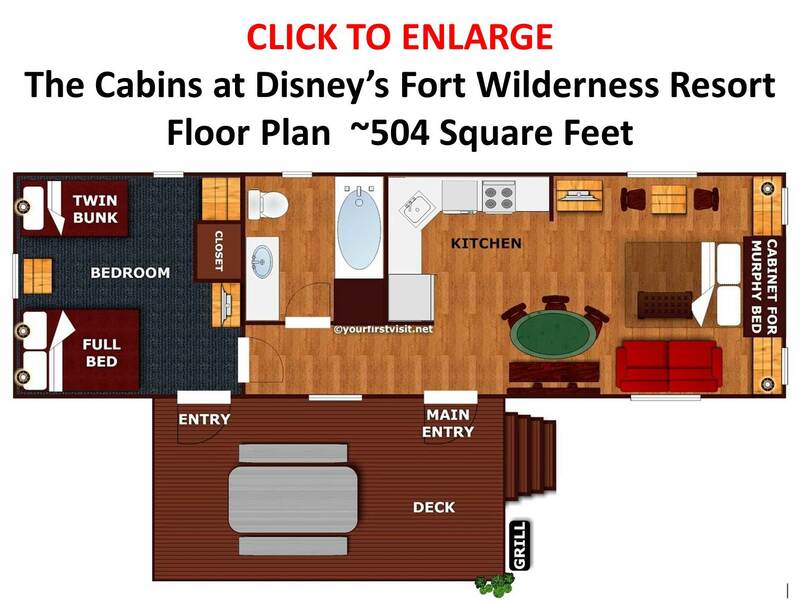 Six person Cabin at Fort Wilderness Resort floor plan. Two sleeping areas. One full and two 70″ bunk beds in a private room. One pull-down full “Murphy bed” in shared living/ dining/ kitchen space. The couch in the shared space is long enough for most kids, and still usable as a bed when the Murphy bed is down, presenting the option of having three people in each of the sleeping spaces. A few cabins have a pull-out full couch instead of the Murphy bed, eliminating this option. 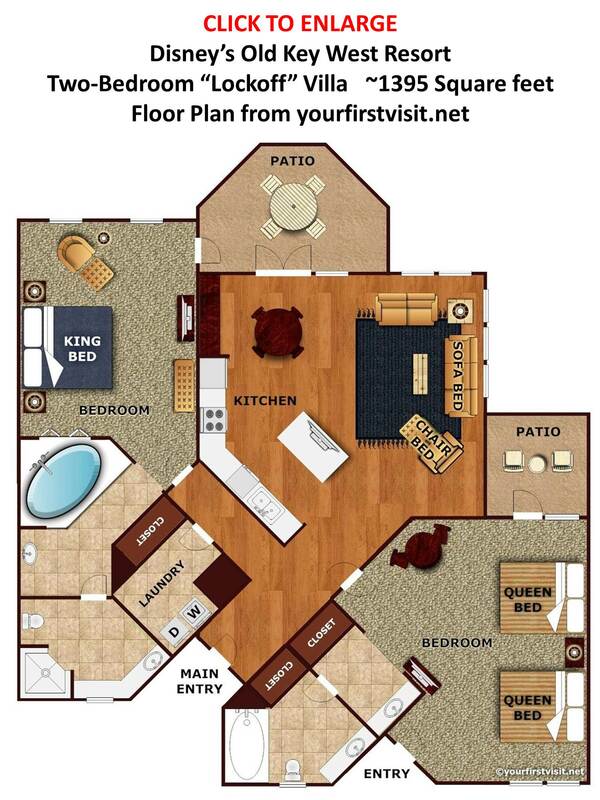 Eight person DVC Two Bedroom Villa floor plan. Three sleeping areas: One king in a private space; two queens, or a queen and a fold-out full couch, in a second private space, and a fold-out full couch in the shared living/dining/kitchen space. 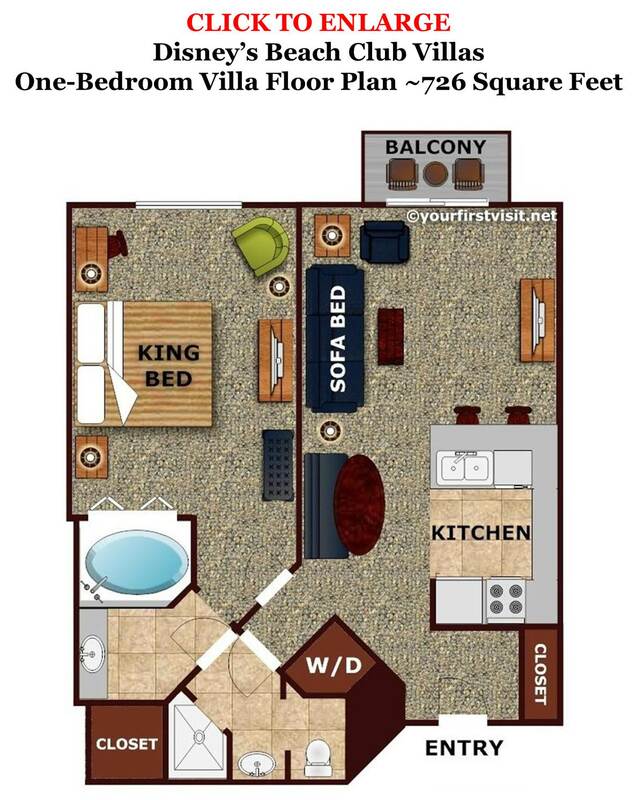 Nine person DVC Two Bedroom Villa floor plan. Three sleeping areas: as in Eight Person Two-Bedroom above, but with a fold-out chair added to the shared space. Note also the third bathroom. 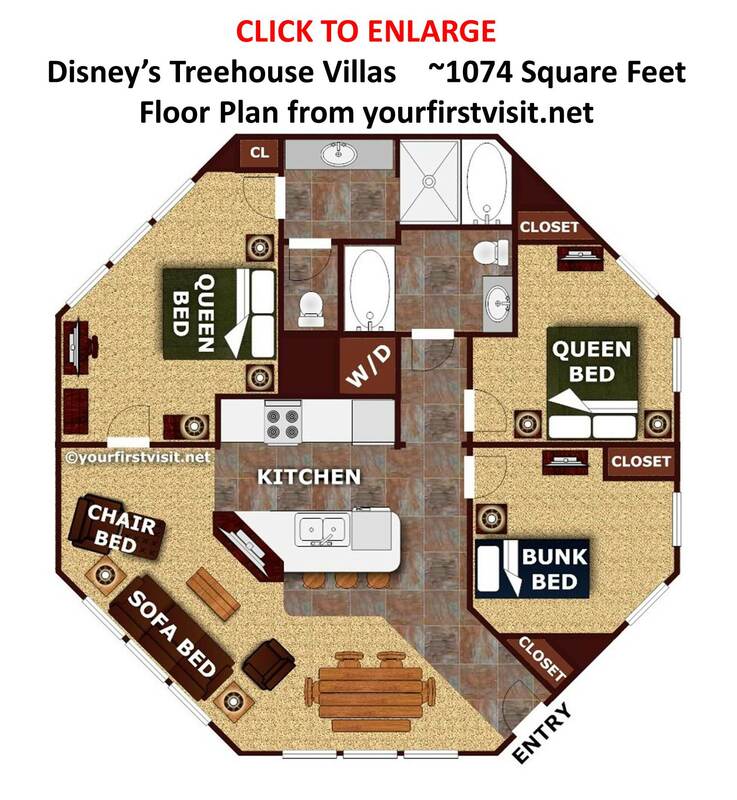 Nine person DVC Saratoga Springs Treehouse Villa floor plan. Four sleeping areas: One queen in a private space; another queen in a private space; two 70″ bunk beds in a private space; a fold-out full couch and a fold-out single chair in the shared living/dining/kitchen space. Twelve person DVC Grand Villa floorplan. Animal Kingdom Villas Jambo House example. Note that although you can sum to 14 sleeping spots in some Grand Villas, WDW will sell MagicBands, tickets, meal plans, and linens only for up to 12 people. Twelve person Grand Villas of various floor plans are at all the DVC resorts except Wilderness Lodge and the Beach Club. See also Erin Foster’s post on TouringPlans.com. Welcome to the first stop aboard Magical Blogorail Teal. Enjoy the ride as this month we discuss some lesser known tips and tricks for Walt Disney World visitors. But there’s no great lower-priced answer for staying on site with a really large group–say ten people. What I recommend on Large Families: Value Prices for groups of this size is a family suite and a standard room at Disney’s Art of Animation Resort, at a price (during the 2013 Fall price season) of $45/person/night. Another even less expensive option is two Alligator Bayou rooms at Port Orleans Riverside, at $41/person/night. Or ten people could tent-camp at The Campsites at Disney’s Fort Wilderness Resort for about $62 bucks a night during the same season*…or about $6.20 per person per night. 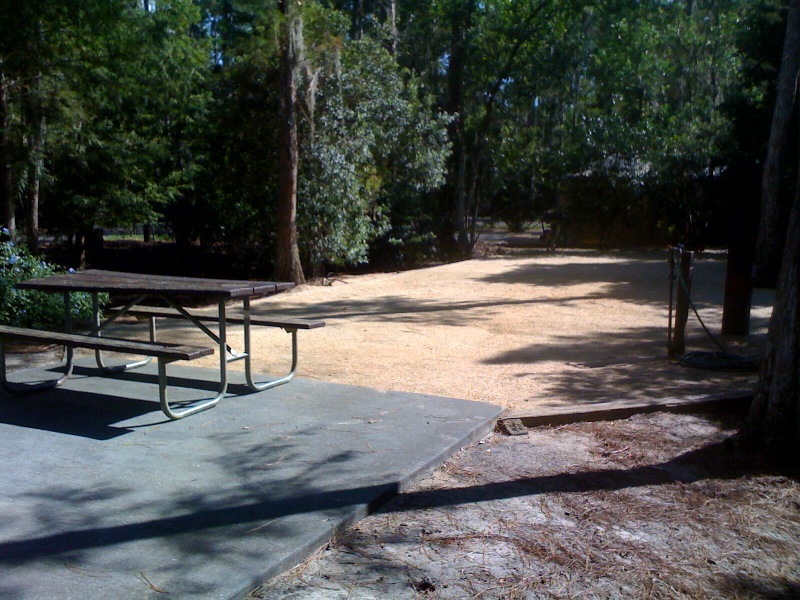 Fort Wilderness campsites hold as many as ten people, and, in a change from past practice, there’s no difference in cost between one person and ten on the site. That’s my lesser known tip! However, tent camping at Disney World is not for the inexperienced, and not really a good idea for first time visitors. For the first page of this review of Disney’s Port Orleans Riverside Resort, see this. Port Orleans Riverside has two areas and three distinct room types. Its Magnolia Bend area has two room types, Royal Rooms and Standard Rooms, each sleeping four in two queen beds. Its Alligator Bayou area rooms sleep five in two queen beds and one short (~66 inches long) Murphy bed. These Alligator Bayou rooms are one of only two traditional moderate resort spaces that sleep 5 (non-Pirate rooms at Caribbean Beach are the other), and these rooms are as a result very important to families a little larger than average. For families that don’t need the extra bed, these rooms have so-so theming, are kind of ugly in spots–although your taste may vary–and are thin on storage. Such families have better options. The only standard moderate resort rooms at Walt Disney World that can sleep five are in the Alligator Bayou section at Port Orleans Riverside. Both the Port Orleans resorts have been refurbished over the past 18 months or so (for details, see this), with the main improvement being the replacement of the old full beds with queens. In addition, the rooms in the Alligator Bayou section of Riverside, which used to sleep a fifth person on a trundle bed, now sleep the fifth person on a mini-Murphy bed.